The US space agency plans to launch two unmanned spacecraft Thursday that will chase each other around the Moon as they use gravity measurements to draw an unprecedented map of its inner workings. Known as the GRAIL mission, or Gravity Recovery And Interior Laboratory, the satellites will launch together on a single Delta II rocket as early as 8:37 am Thursday (1237 GMT), when the launch window opens. 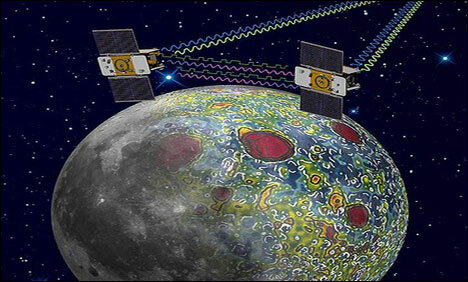 Researchers hope GRAIL will answer some of the mysteries about the far side of the moon, which humans have never explored, and also shed light on how other rocky planets like Earth, Venus, Mars, and Mercury may have formed. "GRAIL is a mission that will study the inside of the Moon from crust to core," said the 500-million-dollar project's principal investigator Maria Zuber.The project is part of NASA's Discovery program, which has launched 10 spacecraft since 1992 to study the solar system. Zuber noted that the Moon has been amply studied since the dawn of the space age in 1959, with a total of 109 missions of various kinds.Twelve humans have stepped foot on the lunar surface, and 842 pounds (382 kilograms) of rocks and soil have been brought back to Earth for further study.In addition, three science satellites are currently orbiting the moon, she said.